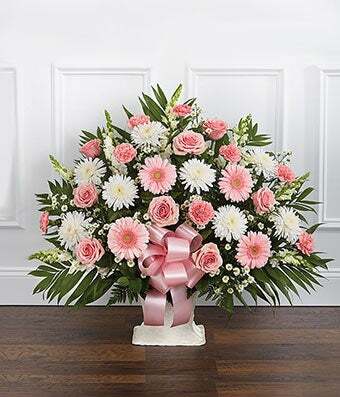 Send a symbol of your love with this Pink and White Flower Funeral Floor Basket with pink roses, white mums, snapdragons and pink carnations. The pink and white floor basket for sympathy is wrapped with a decorative pink ribbon. Medium arrangement measures approximately 32"H x 38"L.